With 15 minutes left on the clock, Dortmund were cruising. And yet, by the end of their match against Hoffenheim, they had to make do with just a point. An Ishak Belfodil-inspired comeback allowed Julian Nagelsmann’s side to share the spoils. This disappointing BVB result allowed Bayern Munich to close the gap to five points as they beat Schalke 3-1. Their performance was not their best, but it was enough to come away with the victory. It was also an important week at the bottom. Hannover and Nürnberg met in a proverbial six-pointer, and it was Hannover who were the stronger of the two sides. Thomas Doll’s first win as the side’s manager means they are now just one point behind Stuttgart in the relegation play-off position. For Michael Köllner, the man in charge of Nürnberg, it was to be his last game in the hot-seat. He was relieved of his duties yesterday, with a new man yet to be appointed. We cover all of the action in our regular matchday analysis. Then, with the Champions League returning this week, we spoke to Josh Sexton of The Anfield Wrap, Liverpool FC’s biggest fanzine. 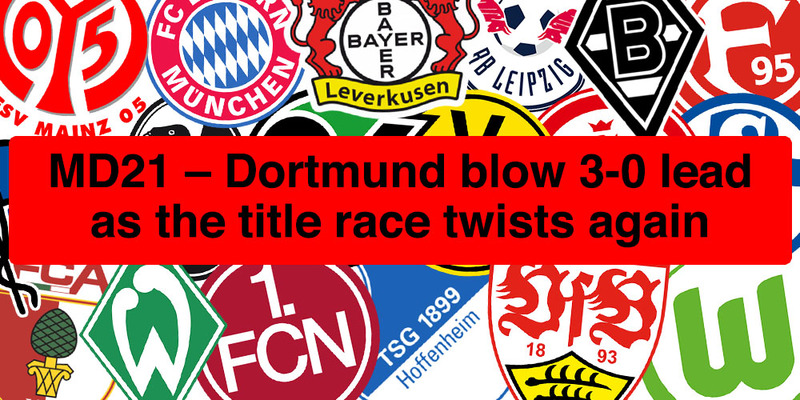 With three match-ups between English and German clubs in this first knockout round, including Liverpool against Bayern, we got Josh’s thoughts on the ties and his opinions on the Bundesliga as a whole. © 2019 bundesliga-diaries.com • Slightly Theme by Nick Ciliak.